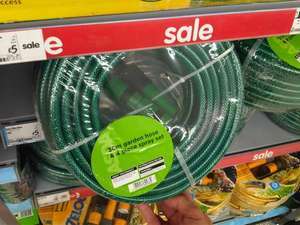 30m garden hose, with 4 piece sprays set i.e. connectors and spray nozzle. Pretty good for a fiver I thought. They also have a 15m Hozelock equivalent for £8 if that's what you prefer. I got the same deal a few weeks ago, but the hose was only 15m. It's very good quality, and a steal at the price. Good stuff, just bought two! How are they making any money on this?? knew these would go on sale soon, they were way overstocked for summer, thanks op. No 30m ones in Bexleyheath Asda, but they had the 15m ones for the same price. More than enough for my garden so went for it anyway! LOL sometimes prices are store specific, from the comments it looks as though no-one else has been able to get the 30m for this price...(_;) the photo you've put on isnt large enough to see in detail!! Definately hot at this price for those who want this type of hose. I picked the last one from Gateshead ASDA today.